Prevailing wisdom holds that the US is facing an educational crisis marked by low levels of writing skill. One primary concern is that teens are not learning the writing content and process skills needed to succeed in continuing education and the workplace. This survey was fielded to add new voices – those of teens – to this debate. Their responses show that teens do write – overwhelmingly. All of them write for school and 93% of them write for themselves. Teens also enjoy writing. While most report that writing for school assignments can be arduous, they feel real satisfaction and accomplishment when such pieces are recognized for communicating ideas effectively and skillfully. Most teens say that they very much enjoy the writing that they do to communicate with their peers via MySpace, Facebook, and text and instant messaging. Many also report finding satisfaction in their creative writing of poems, plays, journals, songs, raps and multimedia pieces. How much teens write is more nuanced. It is highly dependent upon the individual teen as well as the writing expectations placed upon him/her by school, family, friends and other social sources. What prompts teens to write? The short answer is that their writing is instrumental. They write to make something happen. Whether for school, themselves or for a social audience of friends and family, they write to achieve a desired goal. They are very calculating in how they determine what needs to be done to get the goal they want. School writing, for example, helps them get a grade, complete an assignment, or gain access to a specific college, scholarship or much desired extracurricular activity. The creative writing they do for themselves helps them express their emotions, realize a vision, share a talent they are cultivating publicly or win a free iPod. Writing with friends and others in close interest groups via cell phone, social networking site, IM or email offers a chance to keep in touch; learn about the latest trends, crushes, and events; and share insights and written or multimedia content. [I write] . . . whatever they tell me to write about. – 10-12th Grade Boy, Southwestern City. I’m usually, like, I don’t like to write. I don’t write like journals or like diaries or anything. If I have to do something for school I usually just get on the computer cause that’s like easier for me and it looks nicer. But like at school like no one really passes notes . . . more people have phones now. They take them to school so that in study hall or whatever we like text in study hall. – 9-10th Grade Girl, Midwestern City. I am almost always grammatically correct [when I text.] And I do writing books and role playing so that is really important to me. – 11-12th Grade Girl, Pacific Northwest City. Teen 1: Well, if I knew that other people were going to read what I wrote and react to what I was writing then I would make it better and I would want to do the best that I could at it. Teen 2: I write differently when, if I have to say a speech or something in front of my class I write differently than I would than if I was writing it for my teacher . . . [because of] pressure from your peers . . . you wouldn’t write the same thing. – Exchange in 9-10th Grade Girls Group, Midwestern City. Just because teens report writing and enjoying it does not mean that their perceptions of their own writing are fully accurate. A teen may feel s/he is a good writer with a strong grasp of writing conventions, but is not. Thus, even though teens report that they write and are motivated to write, the quality and effectiveness of their writing varies from individual to individual. Teen ideas for making school writing successful – what works and what doesn’t. In contrast to stereotypes of teens as grumbling, disaffected youth with little or no interest in school or its subjects, the teens in our study provided testimony that – depending upon the circumstances – they can find writing pleasurable and can be motivated and inspired to write. For example, when we asked the teens in our focus groups to identify a piece of writing that made them very proud, they generated a diverse list of examples: poems, book projects, research papers, college essays, journals, songs/raps, text messages, computer programs, 4H-projects, plays, etc. Each teen was able to identify and share a success that they had created in writing. Research paper on chromium ions and what they are used for. Because it’s the longest paper I have ever written (13 pages) and I still got an A+. – 9/11th Grade Boy, Southwestern City. I am proud of my current events I did this school year. They were all typed neat with good grammar and I got A’s on all of them. – 9/10th Grade Girl, Northwestern City. My descriptive writing about a rock in the ground. I am proud of it because the teacher said it was the best out of all the essays. College essays because they were thoughtful, took a long time, and got me into a lot of colleges. National Russian Essay I took last year and was given a medal for it. Text message that got me together with my boyfriend. We are both relatively shy but were able to express ourselves over text messages. Poetry journal – full-blown creativity and pure emotional understanding. School work isn’t necessarily a turnoff if it deals with something personally relevant – and gets a good grade. Interestingly, most teens told us they were proud of pieces that were required for school, graded and primarily intended for their teachers or classes. At the same time, some teens also said they were proud of pieces they wrote for peers, themselves or another close person, or for outside competitions. In all cases, teens report being pleased, inspired and motivated by composing a piece of writing that was effective at communicating their thoughts and – in particular – was recognized positively. A key theme in what teens said motivated them to write was one of “relevance.” Teens said, in varying ways, that they wanted to be doing things that mattered socially, in their own lives, and had an impact. Teens get greater enjoyment from the writing they do outside of school than the writing they do in school, and enjoyment of personal writing does not always translate into enjoyment of school writing. Teens tend to enjoy the writing they do for personal reasons more than the writing they do for school. Half (49%) of teens enjoy the writing they do for themselves “a great deal,” compared with just 17% who enjoy the writing they do for school with a similar intensity. In total, nearly one third of teens say they enjoy their school writing “not much” (22%) or “not at all” (10%). The enjoyment teens find in their non-school writing does not always translate into the same level of enthusiasm for the writing they do for school. 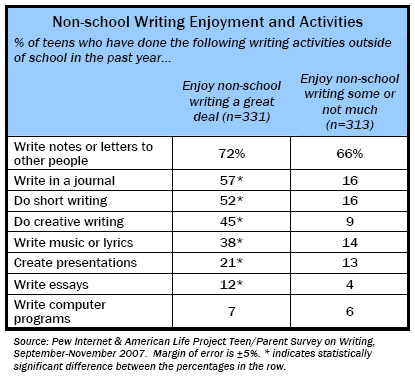 Among teens who enjoy their non-school writing “a great deal,” most (54%) get “some” enjoyment from their school writing. 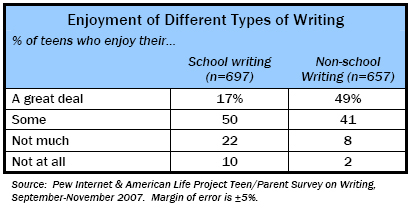 Just 26% of these teens who greatly enjoy their non-school writing enjoy their scholastic writing with a similar intensity, and nearly as many (20%) do not enjoy the writing that they do for school. Enjoyment of school writing is lowest among older boys. The enjoyment teens derive from their school writing appears to fade as teens get older and enter high school. Among teens ages 12-14, 73% enjoy their school writing and 27% do not, while among teens ages 15-17, just 62% enjoy the writing they do for school and 37% do not enjoy it. These gender and age differences are not nearly as pronounced when it comes to the writing teens do for their own personal reasons. Overall, 90% of teens enjoy the writing they do outside of school, a figure that is consistent between boys and girls as well as older and younger teens. The main difference pertains to teens at the upper end of the enjoyment scale—55% of girls say they enjoy writing for themselves “a great deal,” compared with 43% of boys who feel similarly strongly. School writing enjoyment is not correlated with the length or frequency of school writing, and is only loosely related to the types of writing assignments teens do at school. Regardless of how much they actually enjoy the writing they do at school, most teens have a superficially similar scholastic writing experience. In other words, the assignment of more writing at school does not necessarily affect teens’ level of enthusiasm for writing. Teens generally write for school with the same frequency, write papers of similar lengths, and do the same types of school writing regardless of whether or not they enjoy their school writing. There is only one major difference between teens who enjoy their school writing and teens who do not—teens who enjoy their school writing “a great deal” are more likely to do creative writing at school compared with teens who get “not much” enjoyment or no enjoyment from their school writing (81% vs. 69%). With respect to writing enjoyment and writing done outside of school, however, an entirely different story emerges. Teens who greatly enjoy their non-school writing engage in a much wider range of writing activities than teens who get less enjoyment out of the writing they do for themselves. Compared with teens who get some, not much or no enjoyment out of their non-school writing, teens who enjoy their non-school writing “a great deal” are more likely to do a wide range of writing activities in their personal time. It is not possible with this survey to determine what causes teens to write more and be enthusiastic about the writing they do for their own personal reasons. Causality probably flows in both directions to some degree: teens who write most often outside of school are happy about doing it, and because they are happy about doing it, they write more. Teens who enjoy writing are likely to view writing skills as essential to their future success and receive higher marks in their writing classes. Overall, a majority of teens believe that writing is essential for their future success. More than half (56%) said they think writing is essential, and another three in ten say it is important but not essential for later success. Just 12% of teens said writing was only somewhat important, and 2% said it wasn’t important at all. The more teens enjoy the writing they do (whether in or out of school), the more likely they are to consider writing an essential skill for their future success in life. Among teens who enjoy their non-school writing “a great deal,” 67% consider writing to be essential for success in life. Among teens who get less enjoyment from their non-school writing, just over half (51%) consider writing to be an essential skill. Similarly, among those who enjoy their school writing “a great deal,” 74% consider writing to be essential; among those who enjoy it “some,” 60% consider writing to be essential. Even more strikingly, among teens who enjoy school writing “not much” or “not at all,” just 40% view writing as an essential skill for future success. When asked to recall their grades in the classes where they do the most writing, most teens told us that they were firmly above average. The largest group of teens – 44% – said they received mostly A’s and B’s in their writing-heavy classes, and the next largest group, 22%, reported receiving all A’s. Just 13% of teens characterized themselves as B-students in writing, and another 15% owned up to mostly B’s and C’s. Less than 5% of teens said they received mostly C’s or below in the classes where they did the most writing. Not surprisingly, teens who enjoy the writing they do for school report they receive higher grades in the classes where they do the most writing. Among teens who enjoy their school writing “a great deal,” 35% receive mostly A’s in their writing classes and just one in five (19%) receive mostly B’s or worse. 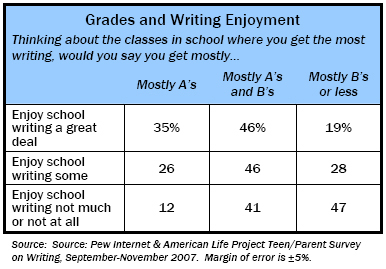 By contrast, just 12% of teens who enjoy their school writing “not much” or “not at all” receive mostly A’s in their writing class, and nearly half (47%) get mostly B’s or lower. Unfortunately, it is impossible to determine from this data whether teens get good grades because they enjoy writing, or whether they enjoy writing because they get good grades. Regardless of the mechanism, however, grades are clearly one of the factors that is most heavily correlated with writing enjoyment. I wrote this program for a robot in Legodacta. And I was pretty proud of it because it was something we had bought to life – I also had built the robot so it brought to life my creation and it felt kind of good. Teens like having the opportunity to select their topics for school writing assignments. Teens in our focus groups said strongly that being able to self-select topics and assignments made their mandatory writing more enjoyable and compelling. [I find writing somewhat enjoyable] only if I get to pick out the topic or the subject I am writing about, or, if I have to write specifically about a book, then whatever book I want. – 11/12th Grade Boy, Northwestern City. If you could be assigned a topic but if you are not interested in it then it’s not going to inspire you to do anything. You will research it and be like ok…but I don’t know…I just had a paper and it was really hard to write because I really didn’t care about it so I researched it a lot but I never got interested in it. – 10/12th Grade Girl, Southwestern City. They said, in effect, that if they were going to spend time and energy doing schoolwork, they wanted it to be something that related specifically to them and their interests. Teens also found it motivating when their writing could have broader impact through being publicly shared in class, in person, in print, or on the Internet. In fact, many teens commented on the positive push publishing or presenting to a formal audience provided for their writing. [Publishing] was pressure because other people are going to be reading your work so you don’t want to turn in just any piece of writing. It is actually printed and there is 1200 copies of it. I wrote my story or whatever about whatever and someone read it and I got to go speak…about it to a bunch of people. It was a cool experience. I read it aloud . . . . [L]ots of people were interested in what I had to say. – 10/12th Grade Boy, Southwestern City. Teens’ motivation to write well comes from getting good feedback – especially from a great teacher. It is people, however – teachers, parents, friends, and reading – that teens credit with being their single most important motivator. I had an English teacher and he was really exciting and he got everyone else like excited and interested in what we were writing about. Like he gave us a lot of free writing time and he would really comment and try and help us be better writers and more creative when we were writing and he made it more fun. And that’s probably why I free write and [am] creative now…. [W]e talked about different types of writing like romances and then like different essays and then he gave us a topic and we could write anything about that topic. It wasn’t like a strict . . . topic it was a wide topic and he would give us a lot of feedback and he would actually read everything that we wrote and make everyone feel good about what they wrote. My history teacher this year really helped me with my writing because it was a college history class so it was the first time I had to sit down and write a 25 page paper. It was worth a third of my grade. She really helped me because it was really difficult. I read a lot so I read stuff and it kind of gives me ideas. It inspires me and gives me more motivation to write. So it starts out as a model and like I can steal some of the little ideas. Back in the 8th grade I wrote a story for my English teacher and he was the best teacher I ever had and I don’t remember what I had to write about [but] I remember him telling me that he was proud and that I was a very talented writer. I was proud of myself. I guess I used to be really bad at reading and in 2nd grade I had a teacher that really took time with me and I love reading. I guess over the years from reading I developed into loving writing. Students don’t write for school unless they are assigned to do it. When we asked teens about what dampens their desire to write, they most often spoke about the writing instruction and assignments they receive in school. Many said that they are either not given writing assignments or are not challenged or inspired by them. Teen 1: I don’t get much homework. Teen 3: I used to write a whole bunch in U.S. History but we got a new teacher. He just lets us slack. Teen 4: In my old English class we wrote journals but then I switched schools and we don’t even do English in English. [We] listen to music. We really don’t do anything. I’m not even kidding. – Exchange in 9/11th Grade Girls Group, Southwestern City. I research a lot of things on the Internet and that is good for me at least. At the same time I am bored at school during like biology because I don’t care about biology because it doesn’t relate to me. Even though it really, really does, but I really don’t care to know how a cell works. I am terribly bored in that class. But like in history I can listen to that teacher talk for the whole hour and feel pretty satisfied. Cookie-cutter, boring curricula don’t help and the teacher should at least be modestly interested in writing . . . and in students. Not surprisingly, teens also said that their interest in writing is often dependent upon the teacher and the curriculum. Teens say that writing is not compelling when the curriculum seems canned, teacher attention is limited, and work is reviewed and graded by computer. A lot of my teachers are like they don’t like to write. Like most of my notes that we take in class like we use an overhead and like it’s already on there and like all my tests are usually . . . and just gets put on the computer and . . . grades it that way and most of tests are done that way. And my homework assignments, like a lot of the teachers, . . . only to put a paragraph answer, do it on computer and they grade it like through the computer, they like scan it on the computer and like spell check. We don’t write that much for school because we work on computers mostly. We have a thing called APlus. Instead of having text books we have a license on the computer and if we have a pretest, if we know the work, then we should pass the pretest. But if we don’t know it yet we have to go to our study and learn it. Then we have to go to a practice. If we pass the practice then we go to the test. Usually [we only write] 1 or 2 pages because we have something called Cornell notes. I think the only thing that really changes if I am bored at school is a teacher. If the teacher is really good then I will be interested. Not all schools have canned or prescriptive curricula, as described here. Our teens’ comments made it clear that their schools and school experiences are quite distinct. Some teens reported very strong writing expectations in their classes: consistent practice, long research reports, standardized tests, etc. Other teens said they get very little English/Language Arts guidance or homework. The writing experiences teens shared were reflections of their school and personal environments. [If I didn’t type, my papers would be] . . . less clean, but [the] thoughts expressed would be just as successful. There were some teens, however, whose experiences with technology outside of school did affect their in-school writing practices and general expectations of time. [T]echnology is not fully the reason [teens have short attention spans] but it’s probably part of the reason. I think it’s because like you were saying with the text messaging and all it goes so quickly you send it and then you get a response like two minutes later. Then when you go to school and they sit there and go ‘oh my gosh, why is this taking so long?’ And it’s just like, ‘yeah.’ And with the instant messaging, it’s really fast. Like you send it; they send it back. Then, when you have to hand in a paper at school and it’s a few days to return it, it’s like ‘I gave it to you like yesterday and it’s taking you four days to grade it.’ So with the technology, you expect something back like quickly then you get back to real life and school and it just takes forever. – 7/8th Grade Girl, Northeastern City. In sum, the teens with whom we spoke related a spectrum of people and things that have encouraged them to learn to write and to write well – most often teachers, reading, favorite authors, opportunities to create and publish authentic work, and their own interests and desires. Of particular importance, however, is the true attention, respect, and praise of a guiding adult or members of a public forum. What inspires teens’ personal and social writing? Teen responses to what motivates their non-school personal and social writing are also instructive. Teens report that the writing they do for themselves on their own time is internally motivated. It helps them work through their emotions and can even help them prepare for, or enhance, their school obligations. Well, I basically [journal about] things I go through on a day-to-day basis. I just, you know, I have to write them down cause sometimes you don’t feel like telling everybody your business so I just write it down . . . . Well, it helped me because if I get a certain topic you know, that relates to me, I can, you know, elaborate on it more. There is also “literary” or persuasive writing that teens do for themselves or others with an eye toward a broader audience. Teens who write plays, fiction, music, poetry and news/non-fiction articles all talk about the importance of being responsible to their audiences by creating strong and interesting works. As noted earlier, some teens receive formal recognition or awards for their writing. Well I write plays for a theater and so it is performed and there is critics there so you want it to be something that you like – writing and expressing how you feel – but also it has to be something that’s pleasing to watch. Like, if you write in a poem you’d be talking to the reader in that poem. I like persuasive writing. That is my strongest point. I can persuade you to do anything and that is what I do to get clients.
. . . I know that people are going to be reading [my articles] . . . . I have to make sure that I get my thoughts down completely so there is not any misinterpretation . . . . Particularly in columns when I am writing my opinion, I have to be careful not to say something to where it is taken the wrong way. Effective communication, self-exploration and self-presentation, and social connection are among the primary motivations behind the writing teens do in blogs, social network posts, emails and instant and text messages. Teens report sharing, supporting, gossiping, joking, and collaborating using these types of electronic communications. Writing in these environments is enjoyable because teens have more control and less pressure. They choose their own topics, do not need to use any particular writing conventions, can write and get feedback quickly, and are typically not being judged. Many teens say they also enjoy being able to multitask and write to more than one person at a time. [Emailing, texting, and IMing] are kind of like a break from school. MySpace: That’s different. It’s just like a conversation. Text messaging is usually leisure like time and stuff like that. I don’t really think of it like ‘oh my stuff is getting published on the computer and it ends up on the Internet.’ I am just writing to my friends or commenting on a picture or whatever. During finals week I got done early and the teachers let me out. So I text messaged all my friends while they were still in class trying to get them in trouble. Teens who do a lot of texting and IMing talk about how they like the immediacy of the conversation. They also take great pride in being able to type fast and to apply their dexterity to typing for school. Well, I’m on the computer so much [that I] type. And to me typing faster helps me get my work done quicker so I can have more time for me to do what I want. Those who use social networking sites not only report taking pleasure in communicating with peers, but also in animating and narrating who they are with songs, pictures, wallpaper and graphics, and links to sites of interest, etc. It sounds stupid and everything but like once you like get into it it’s really like addicting just like everything like you have your song and like you write like all this stuff about yourself and like all my friends basically have it. So like we always like read each other’s pages and like call each other and like kind of, and like you put like 300 pictures up so . . . people’s pictures and stuff and comments. Girls, in particular, are motivated to engage in these more “conversational” writing activities. Many describe themselves as “addicted” to text messaging and MySpace and can spend hours without clear recollection about what they are doing. But it is the ability to both socialize and explore new technical landscapes that compels girls and their male peers in these electronic communication spaces. Teens report enjoying discovering new technical features (e.g., picture commenting on MySpace, using T9Word for texting, using emoticons for email, etc). They also like developing new skills (e.g., typing or text messaging quickly) and distinguishing themselves with them. There are all sorts of things in texting that you can put [in]. Like you can put an exclamation mark in the beginning and the end, or a question mark, or a smiley face, or all caps to show you are yelling. I can spend like hours on My Space like her. I’m like I don’t know how because you know, there’s not that much but you get so many friends and then you have to like change your layout and . . .
Having access to a particular technology and the skills to utilize it does not necessarily motivate all teens to engage in that medium. Most teens are driven to particular platforms, communities or technologies by the underlying personal relationships that exist in that space and the content these relationships generate. In fact, teens who experience a lack of social connection or acceptance when doing social writing often choose to limit their activity. At first when I got on MySpace I was all excited for like a month then I just stopped because it wasn’t that exciting. Because when you don’t get messages and stuff, you get kind of frustrated so I just get off, get on, and get off and check my . . .
By itself, technology is not necessarily a long term motivator for teens’ personal or social writing: more often, it serves as a “hook” that compels them to explore a particular tool, application, or writing practice. Most of the written communication that teens engage in is driven by social and emotional factors, such as developing their identities, finding and exploring their relationships, and learning how to express themselves and respond to others. The technology can facilitate that. Learning Writing is a Growth Process. Teens know that writing is important. Most know that the informal writing they do now will not sustain them as they grow to be adults. However, they take great pleasure in developing personal informal writing styles as a way to express and distinguish who they are now – teens who do not yet need to be adults. A number of the teens we spoke with fully understood that learning to write formally for school and work is a growth process. Some are eager to make this transition and can learn and apply the skills they are taught easily. Others have more trouble or are less willing to toe this developmental line. In more than one session, teens likened learning formal writing to mundane chores or tasteless but healthful eating. Learning to write is “good for you,” they told us, but is not necessarily fun or glamorous. Teen 1: . . . , it’s not bad it’s just not fun. Teen 2: It’s good for you but you don’t want to do it. Teen 1: It’s like eating vegetables. – Exchange in 9/11th Grade Mixed Group, Southwestern City. You are going to be forced in life to do things like meaningless tasks and they have to be done. In that sense, washing the dish is about the same as writing the research paper about that table. It needs to be done. Nearly all teens are aware that writing is something that will impact their future – even if they can’t necessarily see what that future will be. They are motivated by this notion, even if it is rather indeterminate in their minds. Well I guess it’s kind of like a practice makes perfect sort of thing with writing where you just get better the more you do it. And so then that will I guess reflect on your later life like with jobs and . . . stuff. Teens have very individual writing and technology experiences. If we were to systematically profile the practices and preferences of each of the teens we spoke with, no two profiles would be alike. Teens report communicating with adults and peers using all types of media––but there is no clear pattern in how they communicate or which methods they prefer under which circumstances. It all depends upon the situation. That is what poses the central challenge to those who hope to encourage and teach writing to teens. Young adults are immersed in an environment of electronic communication that is vitally important to them, but that may not necessarily lend itself to lengthy, logically structured writing. In teens’ own views, those who can figure out how to tap into their distinctive, situational communications behaviors and connect them to the process of learning how to write will have taught them an invaluable lesson that will improve their lives.